Maintain your roof to minimize hail damage. 2. Can I Make a Claim to My Homeowner's Insurance if My Chimney Leaked and Caused Water Damage? Hail is frozen rain that forms as pellets in the atmosphere. When it falls, it can damage objects on the ground, including the roof of your home. Homeowners insurance protects you from many perils, including hail damage to your roof, but only if you keep your roof in good condition and take steps to minimize damage after the storm. To collect on your coverage, you might need to prove you've taken these actions. 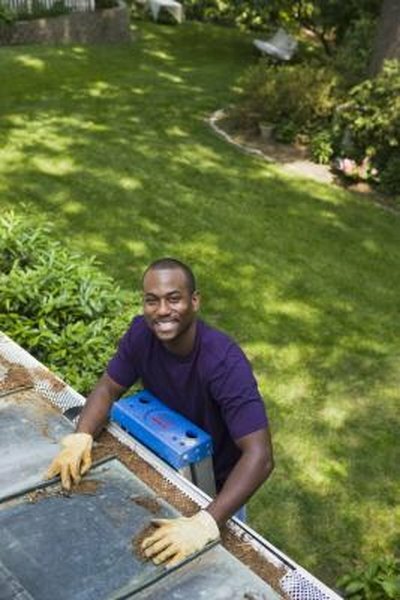 Proper maintenance of your roof requires periodic inspections. Look for loose shingles, water damage and signs of water leakage. Promptly repair any damage. Be aware that insurance companies inspect a roof before paying any claims. Besides looking for hail damage, they are inspecting the condition of the roof. If they find a poorly maintained roof, they may deny your claim by arguing that the hail damage resulted from the condition of the roof and not the hail. Good maintenance without proper documentation is not enough. Keep your receipts to show when the roof was installed. When you purchase a home, obtain as much information about the roof as possible from the seller. Organize all repair and maintenance bills and receipts. Be able to show the insurance company the type of roof, when it was installed and how it has kept up to date. Take pictures and videos of the roof. To avoid giving the insurance company grounds to blame your roof damage on your lack of action, prepare your documentation before the hailstorm as if your homeowners claim might be challenged. Mitigation requires a careful and detailed inspection of the hail damage and prompt action to make sure it doesn't get worse. Cover up any holes in the roof. Take action to limit any water damage due to a leaky roof. Move any personal property that might become damaged. Make a list of all your actions, and report the claim as soon as possible. Any delay raises the possibility of a denial by the insurance company. The insurance company may offer to repair or replace your roof depending on how badly it was damaged. Object to repairs if you believe they will be insufficient. Demand a new roof but understand that you might not get full reimbursement if your roof is old. The insurance company may depreciate any payment based on the age of the roof, depending on your coverage.